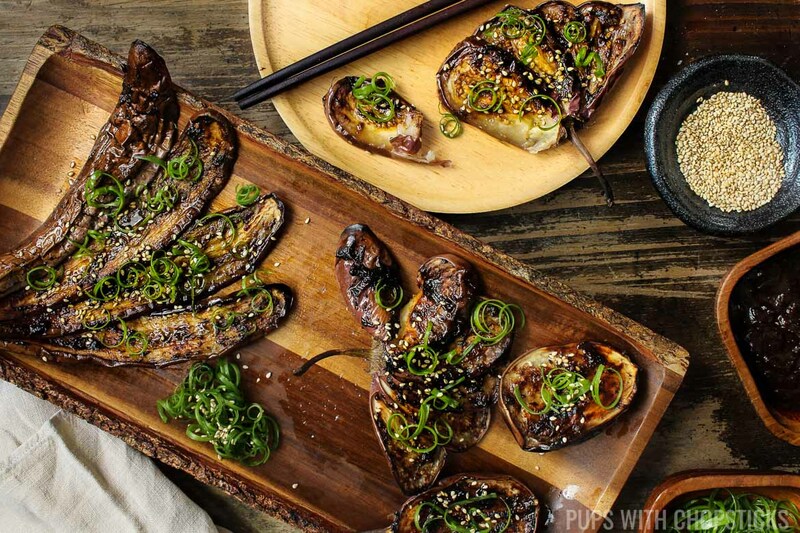 A quick and easy to make over roasted Japanese Miso Eggplant (nasu dengaku) brushed with sweet and savory miso glaze, packed with umami flavors from the black garlic! 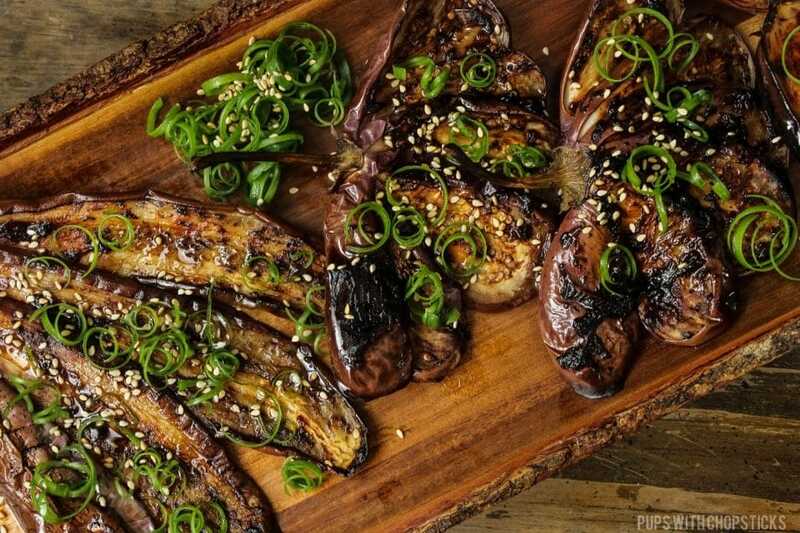 Eggplant is generally not a very popular vegetable but I personally think it’s because they haven’t tried it with coated umami sauces and glazes. 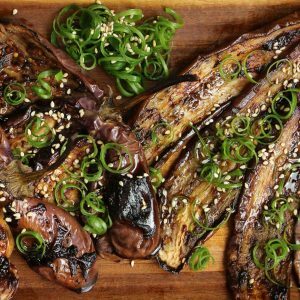 Eggplant, when made right can be creamy, slightly sweet (the Asian eggplant) and absolutely delicious! Especially when it has has a chance to be roasted and caramelized in the oven and smeared with an umami-packed black garlic miso glaze! It is also an incredibly easy vegetable to use and cook with too! Don’t believe me? 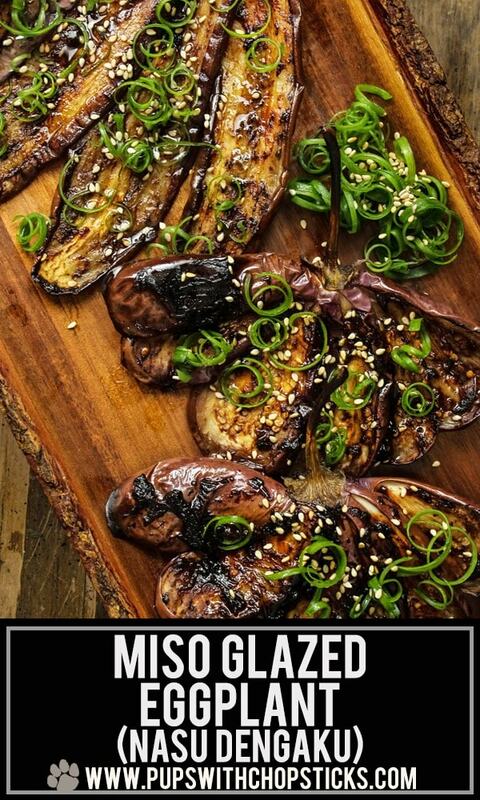 Give this Miso Eggplant (Nasu Dengaku) recipe a try and see! 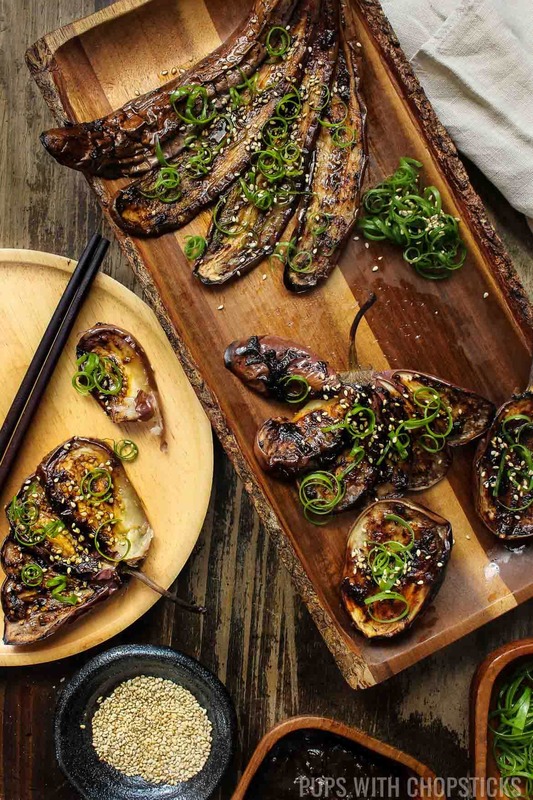 For this glazed Black Garlic Miso Eggplant (nasu dengaku) recipe, you should be able to find the eggplant and miso at your local grocery stores. For the rest of the harder to find ingredients (Mirin, cooking sake and black garlic) it would also be available at an Asian grocery store or specialty grocery store. 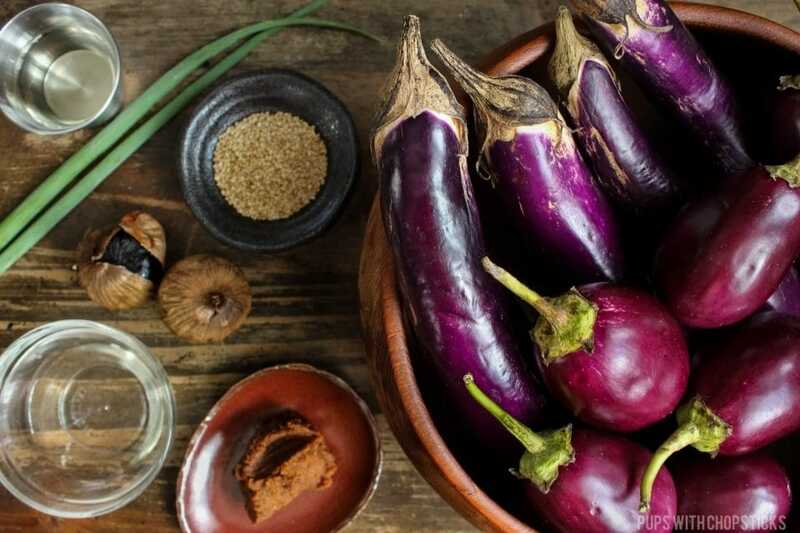 Eggplant – For this recipe, I highly recommend using Chinese Eggplant or Indian Eggplant because it has a sweeter flavor to it. I find that Italian Eggplants have a bitterness to them (which you can remove by drawing out the moisture by sprinkling salt on it and washing it off) but the end result is still is not as sweet as the Chinese/Indian Eggplants. Miso – I like using red miso (Aka miso) recipe because I enjoy the stronger flavors of miso. You can switch up your miso to a lighter one (white or yellow) if you prefer a milder glaze. Black Garlic – Black garlic is a bit trickier to find. It can be found at specialty grocery stores but if you cannot find it in stores, you can find it online as well. Cooking Sake – Cooking sake is slightly saltier and has less alcohol content than regular drinking sake. If you can’t find this, you can substitute it with regular sake, dry sherry or omit it. Mirin – Mirin is similar to sake but is sweeter and has a lower alcohol content. If you cannot find mirin, you can mix 1 teaspoon of sugar with 2 tablespoons of dry sherry, sake or water and use that instead. To maximize the surface area on the eggplant, so that we can get the extra glaze on it I like to make slices on the eggplant lengthwise. 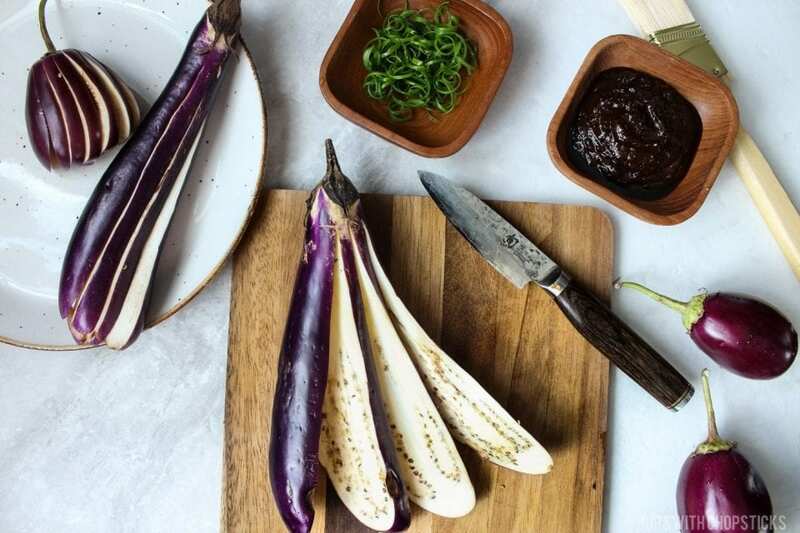 I don’t slice it all the way and keep the stem intact so that it keeps the eggplant together so that it makes it easier to flip when it is browning in the oven. 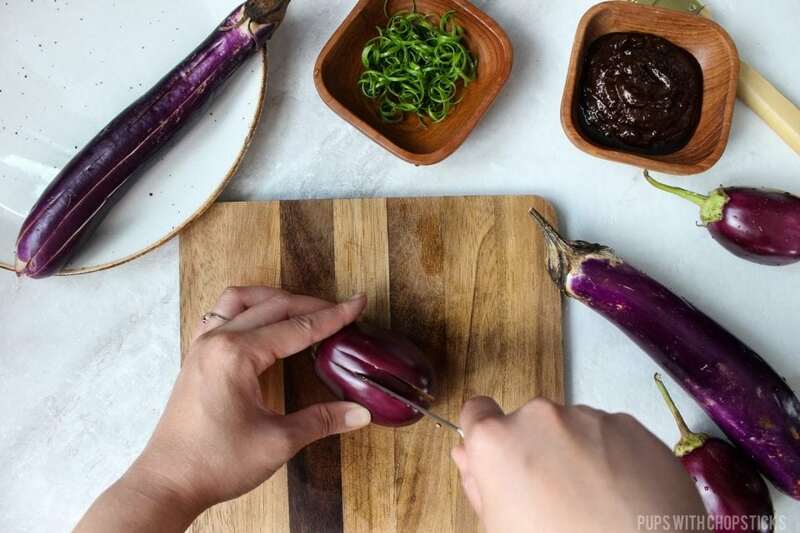 It is a completely optional step, so if you don’t feel like making multiple slits like the photos below, you can cut the eggplant lengthwise all the way through the step into 2 pieces as well. Oh, and if you have extra glaze – don’t throw it out! I tried grilling meats and topping it with the glaze at the end and it tasted amazing! 🙂 Try it out! 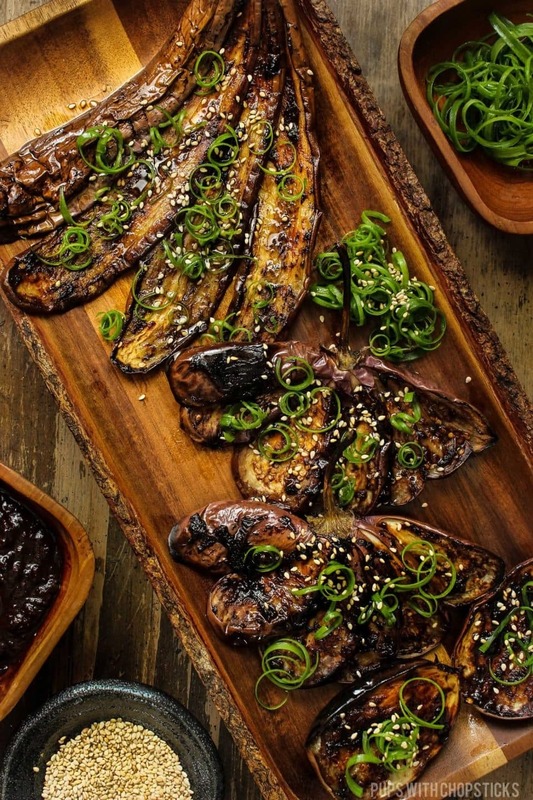 WHAT TO SERVE WITH MISO EGGPLANT (NASU DENGAKU)? 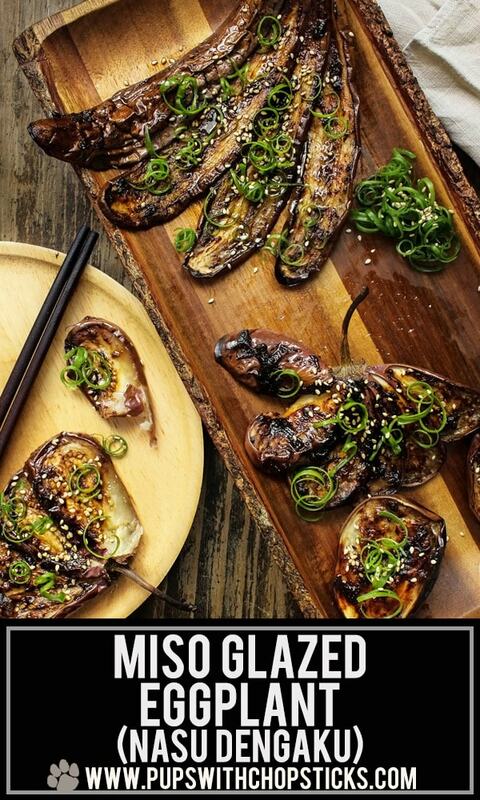 You can have this miso eggplant as a vegetable side dish, or a main dish. If you are having it as a main dish, here are a few examples of what you can enjoy it with! Noodle dishes – this pairs well with any type of noodle dish. Although the more flavorful and saucy the noodles, the more you will miss out on the black garlic miso glaze. Try it with our Garlic Noodles recipe which also has a bit of black garlic in it! Rice dishes – I personally like this with plain white rice. If I am feeling fancy, I’ll make it a simple Egg Fried Rice, which is very simple so it doesn’t cover up the flavors of this dish! Tofu – Sometimes I like to buy some firm tofu, and pan-fry it until it has browned and is slightly crispy! Then I’ll drizzle a bit of sweet soy and green onions over it and have this with the Miso eggplant! LOOKING FOR MORE SIDE DISH RECIPES? 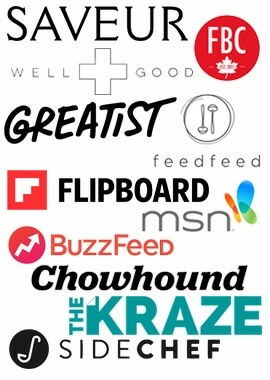 TRY THESE! Set the glaze aside for later. Make lengthwise cuts running down the eggplant, 1/2 inch apart. I found it easiest to use a paring knife or a small knife to make these cuts. Alternatively, If you don’t want to make multiple slits, you can just cut the eggplants in half, lengthwise. Lightly oil the skin and between the slits and run your fingers through it so the oil is spread to a thin layer all over the eggplant. 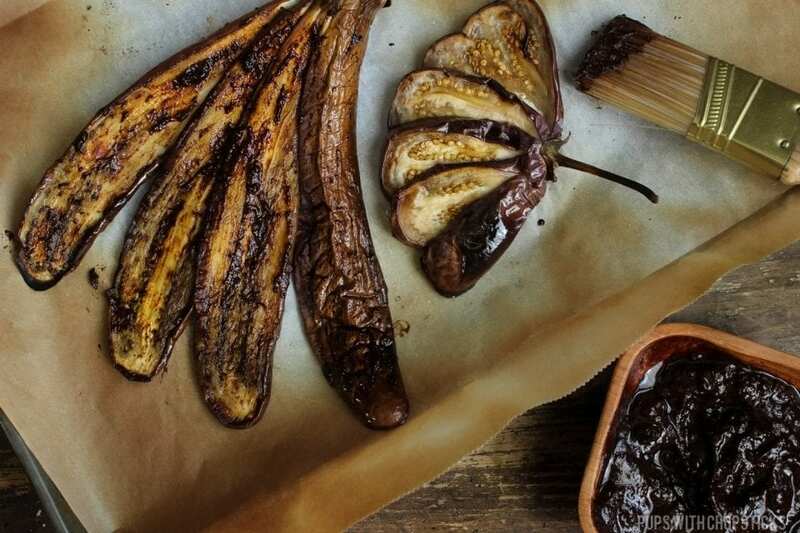 Line your cookie sheet with foil and fan out the eggplant. Some may not like to fan out easily, don’t worry when it starts to soften up it will be easier to fan out. 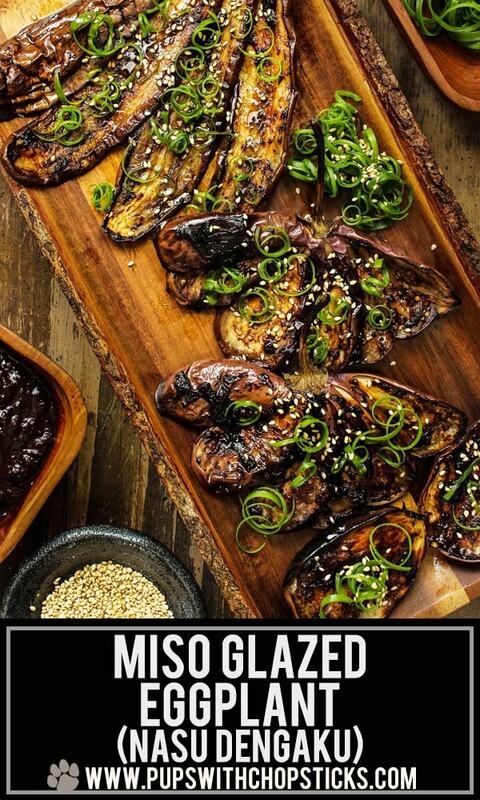 When the eggplant looks brown and roasted, brush on the glaze and put it back in the broiler for 2 minutes. Top it with some sesame seeds and green onions and enjoy! If you have extra glaze – save it and try using it on grilled meats or mix it into some stir-fried noodles! For this recipe, I highly recommend using Chinese Eggplant or Indian Eggplant because it has a sweeter flavor to it. I find that Italian Eggplants have a bitterness to them (which you can remove by drawing out the moisture by sprinkling salt on it and washing it off) but the end result is still is not as sweet as the Chinese/Indian Eggplants. I like using red miso for this recipe because I enjoy the stronger flavors of miso but you can definitely use the lighter misos (white or yellow) if you prefer a milder glaze. If you can’t find cooking sake, you can substitute it with regular sake, dry sherry or omit it. If you cannot find mirin, you can mix 1 teaspoon of sugar with 2 tablespoons of dry sherry, sake or water and use that instead.